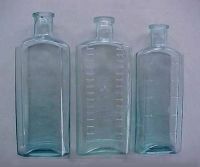 "Commonly referred to as Admiralty Bottles"
When this website was first launched in 2001 there were only a few examples from the 19th century. Since them with the help of archaeologists, collectors and historians from around the world scores of examples have been recorded and categories established. There is a much better understanding of the letter and number codes used. Much of this new information was published in a full colour book in 2015. Why a web page on "Admiralty bottles" ? In October of 2001 my wife Linda and I visited the frigate HMS Trincomalee built for the British Navy prior to 1830 and now moored at the Historic Quay in Hartlepool, England. During the tour I spoke with some of the guides and found that they were not aware of the types of bottles that would have been on board and were interested in learning more. Many of the bottles shown on this website and published in the book would have been in use on the HMS Trincomalee when she was at Esquimalt on Vancouver Island in the 1850s. My own interest started in the late1960s when I lived within walking distance of the Esquimalt Naval Base which was home to much of Britain's Pacific fleet in the 19th century. I also briefly served in the Royal Canadian Naval Reserve at Esquimalt as summer employment while attending university. My interest was peaked when I met divers who were finding "admiralty bottles" in the harbour in the 1970's. I acquired many of those examples which were donated to CFB Esquimalt Naval and Military Museum in 1990. Since that time I have continually discovered new examples and related information and always welcome new information. 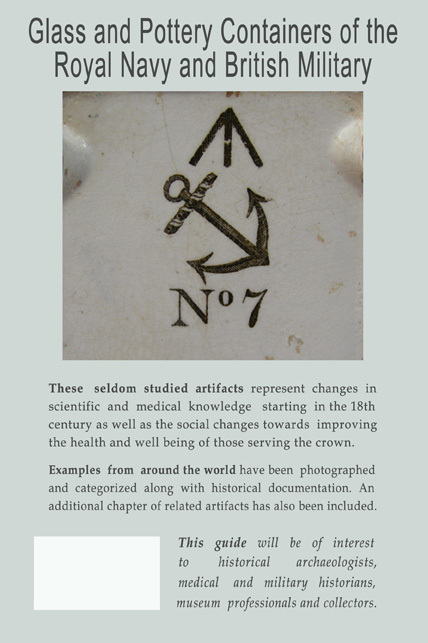 From back cover: These seldom studied artifacts represent changes in scientific and medical knowledge starting in the 18th century as well as the social changes towards improving the health and well being of those serving the crown. Examples from around the world have been photographed and categorized along with historical documentation. An additional chapter of related artifacts has also been included. This guide will be of interest to historical archaeologists, medical and military historians, museum professionals and collectors. ... 234 pages with over 400 colour photos on high quality paper in a 6 by 9 inch format. Published by First Choice Books, Victoria, British Columbia, Canada. Reviewers: Dr. Mark Warner, professor of archaeology, University of Idaho, Grant Keddie, Curator of Archaeology, Royal British Columbia Museum, and Tristan Carl, B.A. Chapter 1 - Introduction: This covers the extent of where these bottles are found and the overall importance of what they mean in terms of medical and technological advancements, starting at the end of the 18th century . Chapter 2 - Possible origins and history of the broads arrow: The use of the broad arrow goes back thousands of years in Europe. Its use in England to mark crown property goes back several hundred years. Especially during the 19th century, almost everything down to the brass screws on the ship would bear a broad arrow stamp. 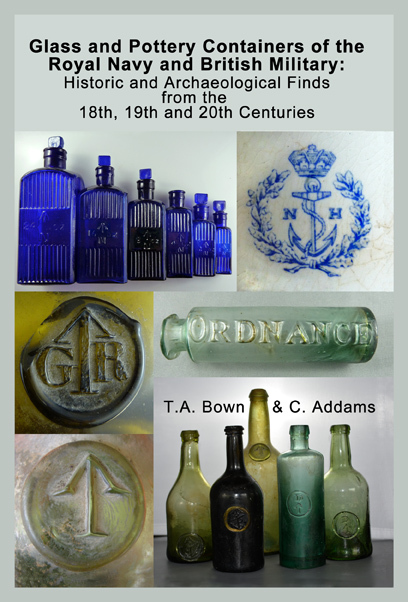 Chapter 4 - Seal bottles of the British Military: This chapter discusses the time period that glass seals were applied to Royal Navy bottles and some research on when seals were being ordered. The known bottles are categorized and described with full colour photographs. Chapter 5 - Archaeological contributions form Antigua: Formal excavations in Antigua have revealed a number of seals and some unique Royal Navy examples. Excavations have also provided evidence of the toxic environment many Royal Navy sailors worked in. Chapter 6 - Lime juice and the Royal Navy: More sailors died from disease and scurvy than wounds from battle. This chapter gives some overview of the use of lemon and lime juice in the Royal Navy and features photos of the known and suspected bottles that contained juice. One of the first human trials to discover a cure for scurvy was conducted by the Royal Navy in the 18th century. Chapter 7 - Apothecary bottles: This chapter gives some historical background on the introduction of government supplied apothecary bottles, possibly staring as early as 1795. Figures are included that show the meaning of the number and letter codes that have puzzled archaeologists and collectors alike for many years. All of the letter and number code bottles that were found are shown as colour photographs. Some of the lists provided indicate that additional examples probably did exist and may yet be found. Chapter 8 - Victorian Poison Bottles: These are amongst the most commonly found containers bearing government markings. This chapter has colour photographs of all of the examples found. At least one label indicates that some of these bottles were used by civilians in one of the first National Health Care schemes. All of the examples found are shown in full colour. Chapter 9 - Engraved Bottles: Some of the earliest bottles were high quality but instead of seals they had engraved arrows along with code numbers and letters engraved. These bottles tend to be rare and those that were found are included in colour. Chapter 10 - Etched bottles: Especially by the 20th century, a variety of bottles (mostly poisons) have acid etched broad arrows. Photographs and descriptions are included. Some labels show they were being provided by private companies. Chapter 11 - Bottom Markings: A wide variety of bottles are found with broad arrows on the bottom. Examples that were found were photographed and recorded. Although some appear to be obvious government broad arrow marks confirmation of this is still needed through archaeological or historical records. Chapter 12 - Pottery Containers: Pottery medicine and percussion cap jars were recorded and photographed. The early pottery medicinal jars are very rare. Some of the many known pottery SRD jugs from WW1 are also included in this chapter. Chapter 13 - Soft Drinks, Regimental and Canteen bottles: The abuse of alcohol was common, so the government encouraged soft drinks in canteens and clubs staring towards the end of the 19th century. They are seldom found in large quantities and tend to be quite local. A number of examples were listed and photographs were obtained when possible. An extensive search for these bottles would likely warrant a publication on their own. Chapter 14 - Miscellaneous related artifacts: When Dr Mark Warner reviewed the first draft of this book, he suggested a final chapter of related artifacts. We saw and photographed so many interesting items we were able to add that. Preference was given to containers, but all of the artifacts could be found in an archaeological setting. References: All information from outside sources electronic or paper was referenced. Vernon Erwin, collector, USA, May 2015: WOW! This book is very professionally published. The information and photos are a perfect reference for every bottle collector. I've been in awe looking at the many variations and colors of these bottles. Very well done. If you put this book in the Poison/Black Glass category on Ebay, it would fly off the shelves. Thanks for the mention of me and good luck! Bill Wilson, Vancouver Island Author for the Fraser Valley Antiques and Collectibles Club of Vancouver, British Columbia, May- June 2015: NEW BOOK! From cover to cover the book is lavishly illustrated with striking colour photos, all 234 pages. Most of these were shot with superb skill by Tom’s wife, Linda Bown. Tom’s science background is there on every page, with precision descriptions of artifacts. However, the book is also very much readable for the average collector. I especially enjoyed the concerted effort to include the origin of the artifacts, especially those found in British Columbia. This is an important reminder for the rest of us out there finding our own artifacts to keep track of where they were found, even what they were found with. To compile the book Tom & Linda travelled to Bermuda. They discovered a treasure trove of information to help explain the “Broad Arrow” and “Fouled Anchor” marks left on Royal Navy artifacts, as well as the unusual numbers often found on the bottles. Tom also reached out to sources in England, Australia, and South Africa, and other countries to gain the “big picture”. I have no doubt that this book will be quoted many times in the years ahead by other historians. Favourite parts? I was really interested in Chapter 6 “Lime Juice and the Royal Navy”, but the lipsmacking photos in Chapter 13: “Soft Drinks, Regimental and Canteen Bottles” were also very good. I was very keen on the BC angles discussed, especially on pages 92 & 103, but do not overlook the discussion of manganese and how it produces purple coloured glass on page 88 – some good stuff there. Chapter 14, called “Miscellaneous Related Artifacts” was a grab – bag of other cool stuff as well. The book benefits from the passage of time – living close to Esquimalt and being a keen collector and historian since the 1970’s, Tom has observed and now summarized what collectors have found over the years – if you can believe it, divers used to look for bottles right beside the warships back in the day (page 178 &180). He even points to a recent loss of a historic site in Esquimalt in 2012 (page 165). Overall, this book is a bargain, even if you don’t collect these artifacts. It is very much a worthwhile read and you should be more knowledgeable about our bottle collecting hobby after you finish it. The cost of the book is US $35 plus actual cost of shipping. The book can be purchased directly from the author coffinisland@shaw.ca or through Limebay Books at Abebooks or Biblio.com. Considerable savings on shipping for more than one copy. Please enquire for discounts on orders of 5 or more copies. Why is the name "Coffin Island" used for this domain? The creator of this webpage, Tom Bown, worked with Camosun College Archaeology staff to create the book Victoria Underfoot, published in 2008. Tom contributed the original concept, and two chapters: "The Old Songees Village Site: A Case for Historic Archaeology" and "Between the Tides: Mudlarking in the Gorge". This fascinating history of archaeology in Victoria has won four awards: the Monday Magazine M Award for Best Non-Fiction Book, the Victoria Hallmark Society's 35th Annual Heritage Communications Award, an Award of Honour from Heritage BC., and the Canadian Archaeological Association Communications award for 2009 and contributions towards Canadian Archaeology. A related web site on Archaeology in the Victoria area is Archaeological Society of British Columbia (Victoria Chapter). If you are interested in used or antiquarian books, view the current books for sale at Limebay Books.